Published: Jan. 30, 2018 at 02:25 p.m. Updated: Jan. 30, 2018 at 02:32 p.m.
Take a look at the career of Chris Long through the years. 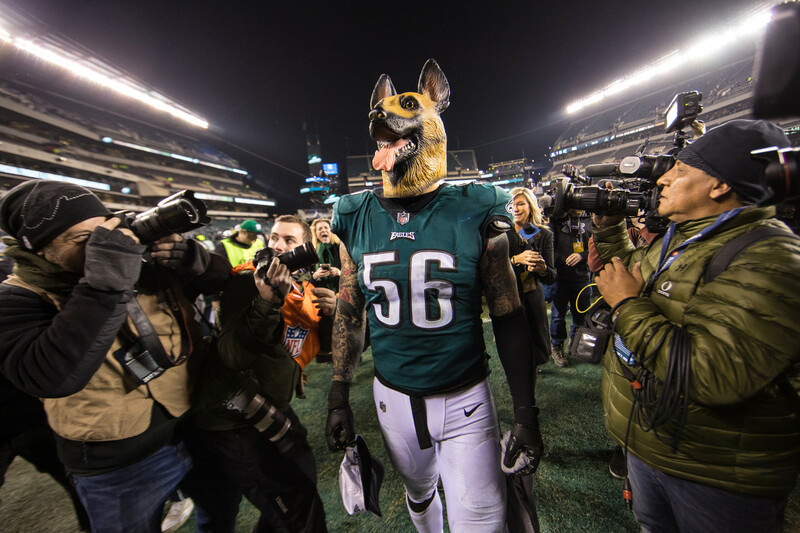 Philadelphia Eagles defensive end Chris Long (56) leaves the field wearing a dog mask in reaction to the Eagles being home under-dogs for their past two playoff games despite being the first seed after the NFC Championship Game against the Minnesota Vikings, Sunday, Jan. 21, 2018, in Philadelphia. The Eagles defeated the Vikings, 38-7. Philadelphia Eagles defensive end Chris Long (56) rushes during the game against the Chicago Bears, Sunday, Nov. 26, 2017, in Philadelphia. The Eagles defeated the Bears, 31-3. Philadelphia Eagles defensive end Chris Long (56) rushes around Minnesota Vikings defensive tackle Rashod Hill (69) during the NFC Championship Game, Sunday, Jan. 21, 2018, in Philadelphia. The Eagles defeated the Vikings, 38-7. Former New England Patriots defensive end Chris Long (95) in action last season during a Week 2 football game against the Miami Dolphins on Sunday, Sept 16, 2016, in Foxboro, Mass. The Patriots defeated the Dolphins, 31-24. Former New England Patriots defensive end Chris Long (95) celebrates after Super Bowl LI against the Atlanta Falcons at NRG Stadium, Sunday, Feb. 5, 2017, in Houston. The Patriots defeated the Falcons, 34-28, in overtime. Former New England Patriots defensive end Chris Long after sacking Miami Dolphins quarterback Ryan Tannehill during a NFL football game at Gillette Stadium in Foxborough, Mass., Sunday, Sept. 18, 2016. Former New England Patriots defensive end Chris Long (95) takes a break during warmups prior to a 2016 Week 7 football game against the Pittsburgh Steelers on Sunday, Oct. 23, in Pittsburgh. The Patriots defeated the Steelers, 27-16. Chris Long (72), formerly of the St. Louis Rams, smiles as he walks off the field from a win over the Washington Redskins at FedEx Field on Oct. 12, 2008, in Landover, Maryland. St. Louis won, 19-17. Former St. Louis Rams defensive end Chris Long, left, talks to his brother, Chicago Bears guard Kyle Long, following an NFL football game on Sunday, Nov. 24, 2013, in St. Louis. The Rams won, 42-21. Former St. Louis Rams defensive end Chris Long (72) celebrates a sack with linebacker David Vobora (58) during the fourth quarter of an NFL football game against the Arizona Cardinals on Sunday, Nov. 22, 2009, in St. Louis. Arizona won, 21-13. Former St. Louis Rams defensive end Chris Long takes up his position during the second quarter of an NFL football game against the Oakland Raiders on Sunday, Nov. 30, 2014, in St. Louis. Former St. Louis Ram Chris Long fires up the team in a pregame huddle against the Arizona Cardinals during an NFL football game in Glendale, Ariz. on Nov. 25, 2012. The Rams defeated the Cardinals, 31-17. Former St. Louis Rams Chris Long looks on from the sidelines against the Buffalo Bills during an NFL football game on Sunday, Dec. 9, 2002, in Orchard Park, New York. The Rams won the game, 15-12. Former St. Louis Rams defensive end Chris Long (91) during the NFL regular season game against the San Francisco 49ers on Sunday, Nov. 11, 2012, in San Francisco. In this April 26, 2008 photo, defensive end Chris Long, right, stands on stage with his father, pro football Hall of Famer Howie Long, after being announced by the St. Louis Rams as the second overall pick in the NFL draft in New York.